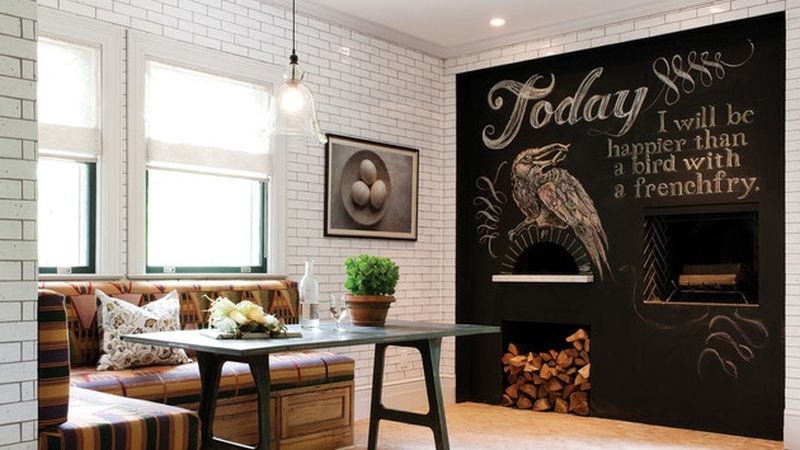 Create a colorful, functional chalkboard in any room with chalkboard paint that's erasable, washable, and durable. If an all-purpose primer is needed, we recommend using Fresh Start® High-Hiding All Purpose Primer (046). When applying chalkboard paint over plastic, we recommend priming with Insl-x® STIX® Bonding Primer (SXA 110) for best results. Metal surfaces should be cleaned with Super Spec HP® Oil & Grease Emulsifier (P83) before applying chalkboard paint. Shiny metal surfaces should be lightly sanded before the chalkboard paint is applied. Use painter's tape to mark off a space for your chalkboard. Using a brush or roller, apply the chalkboard paint within the taped-off area. For best results, use a Benjamin Moore custom-blended nylon/polyester brush or short-nap roller. For erasing, we recommend using a clean, damp cloth or paper towel. We do not recommend using a chalkboard eraser. Because of the additives used in some varieties of chalk, which can leave a residue when erased, we recommend using light-colored chalk designed for use on chalkboards. Server responsed at: 04/23/2019 4:33 a.m.